Do you have one thick ear lobe? Or two? Thick ear lobes (if only one side is thick) can be caused by infection. Is the ear lobe red or warm to the touch or tender? If so, see your health care provider. Allergies to metals in ear jewelry can also cause inflammation of the ear lobes, typically (but not always) on both sides. Are both ear lobes thick? Not tender or red? Then reading the following information might save your life. Or not. Some people don’t want to know. do you have thick ear lobes? or a diagonal crease in your ear lobes? What’s the connection between ear lobes and heart disease? While cholesterol and fats are being deposited in the inner lining of the arteries, they can also be deposited in the ear lobes, making them thicker. Do you have thick ear lobes? One of our patients said, “Those ear lobes saved my life.” After hearing his ear lobes were a red flag for heart disease, he got tested. He had more artery disease than 99% of guys his age. Now his arteries (and his ear lobes) are getting better. Click the “Reversing Heart Disease” video to hear his story. You can see his artery trending report here. If you have thick ear lobes or a diagonal crease in your ear lobes, you should consider getting tested to determine what level of risk you carry. To find out more about our risk assessment process, click the "I have thick ear lobes" button below. Do you have a diagonal crease in your ear lobes? 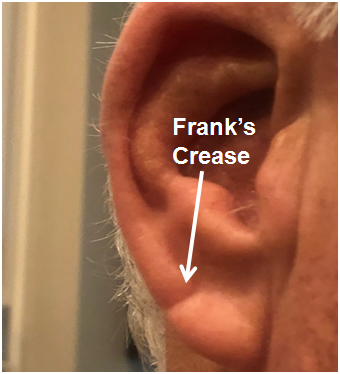 Eventually, as people get older, their thick ear lobes can develop a diagonal crease, called “Frank’s crease” or “Frank’s sign (1).” By the time Frank’s sign appears, there is an extremely strong association with heart disease, more than just a red flag. This study (2) found that 78% of people with Frank’s ear lobe crease had heart disease. An autopsy study in Sweden also found a strong association with coronary disease and sudden cardiac death (3). do you know someone with thick ear lobes? Do you know someone with a diagonal crease in their ear lobes? Ask them the question: "Are you CardioSound?" Or send them a link to this page. You just might save a life. Although having thick ear lobes is one risk factor for heart disease, normal sized ear lobes does not reduce your risk. The absence of Frank’s ear lobe crease does not mean you do not have heart disease. Lots of people with normal ear lobes have heart attacks. If you have a family history of heart disease, or other risk factors, consider getting tested to determine what level of risk you carry. At CardioSound, we can tell you what level of risk you carry. Testing requires a genetic blood test (which we can do anywhere in the U.S.) and a trip to Atlanta, Georgia. If your risk is high, then we can help you. Or we can help your local doctor reduce your risk. I have thick ear lobes.